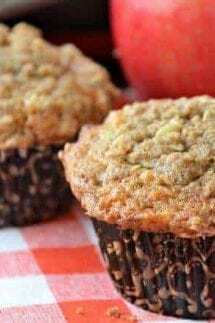 These Apple Muffins with a crumb topping are not only delicious but will make your house smell amazing. The fresh apples, allspice, and cinnamon in these muffins are perfect for fall. Add egg mixture in the dry ingredients and stir until everything is combined. Stir in the chopped apples and pecans. I used a mini food processor to chop the apples. Use a regular size ice cream scoop and scoop into cupcake baking liners. For the Crumble: Mix together flour, oats, brown sugar, allspice, cinnamon and soften butter. Add tablespoon on top of the muffins before baking. Bake the apple muffins for 25 minutes at 350 degrees.